The Road to Madrid will not only be paved with Gunners, Devils, Reds and Blues, but with bad weather. 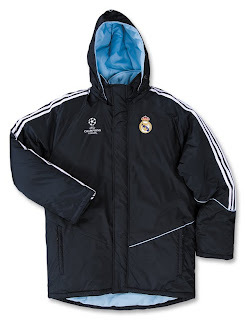 Therefore, you're bound to see the Galacticos coaches wearing this cool Official adidas Real Madrid UEFA Champions League All-Weather Jacket on the sidelines of many European stadia, beginning today in Zurich's Letzigrund Stadion - if it rains. They (and you) would not only look good, but you will stay warm and dry from all the elements, as the full-zip jacket includes a storm flap, fleece-lined zippered pockets, fleece-lined stand-up collar, fleece elastic cuffs and detachable hood. Also features a longer cut for added warmth. It's made of 100% nylon shell with 100% polyester filling and lining. With a straight hem/waist design, a screened Real Madrid team badge and Champions League logo at front, so you'll feel just like you're at the match!